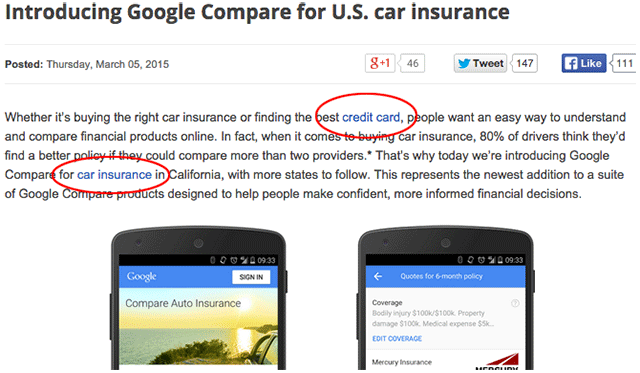 Yesterday, Google announced they will be officially getting into selling auto-insurance through google.com/compare/autoinsurance/. Yes, this is a big deal but SEOs took notice of the blog post announcing it. If you look, you will see three links in the post, the first two are keyword rich anchor text links that are [credit card] and [car insurance] both linking to Google properties. The last link is a [here] link so people can learn more about the service. @Marie_Haynes This phrase completely fit here, "Practice, what you preach"! I wonder if Google will leave it as is or decide to change it in the future. Update: Shortly after this story went live, Google removed the keyword rich anchor text from the blog post.